Long time readers will know that we visited Montreal for the day in mid November when we spent our time exploring the old town. So when we visited for the F1 a few weeks ago we had a very good idea of what we wanted to do when we weren’t watching fast cars. This list was not long, featuring just poutine and Mont Royal but we did manage to squeeze a couple of extra things in too. 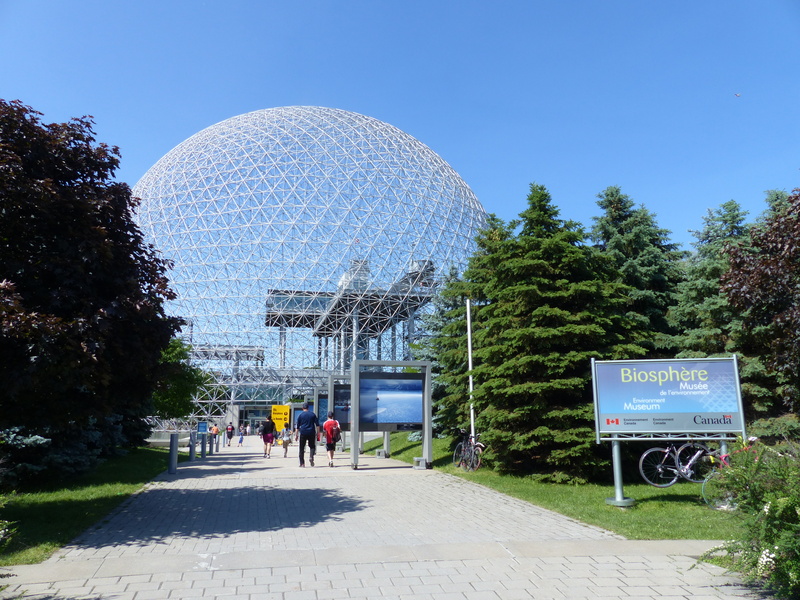 First up was the the Biosphère, located on the same island, Île Notre-Dame, as the F1 track, and so we walked past it a few times on our way to and from the circuit. A heads up for anyone visiting the island – the Biosphère has nice toilets and water fountains in the lobby! 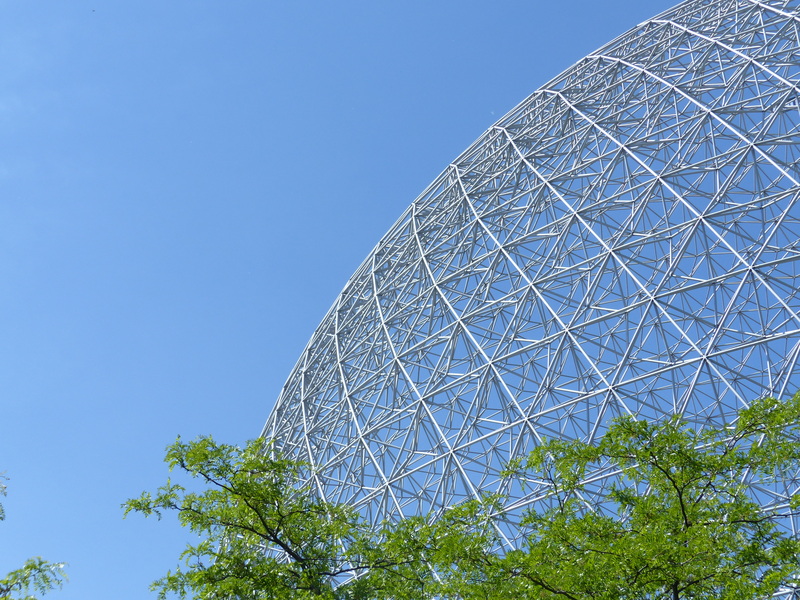 Inside the huge spherical grid-like structure is an environmentally themed museum. Unfortunately we didn’t feel like we had quite enough time to do it justice, so we didn’t pay to go in, but we did enjoy looking at the displays in the lobby and the large outdoor photographs of the Arctic. If we ever end up making a third trip to Montreal then this is definitely on the ‘to do’ list. We left the Île Notre-Dame and headed downtown, passing through a F1 street festival on Rue Peel, which wasn’t particularly exciting, and seemed to mainly consist of fast cars and alcohol displays – probably not a good mix! 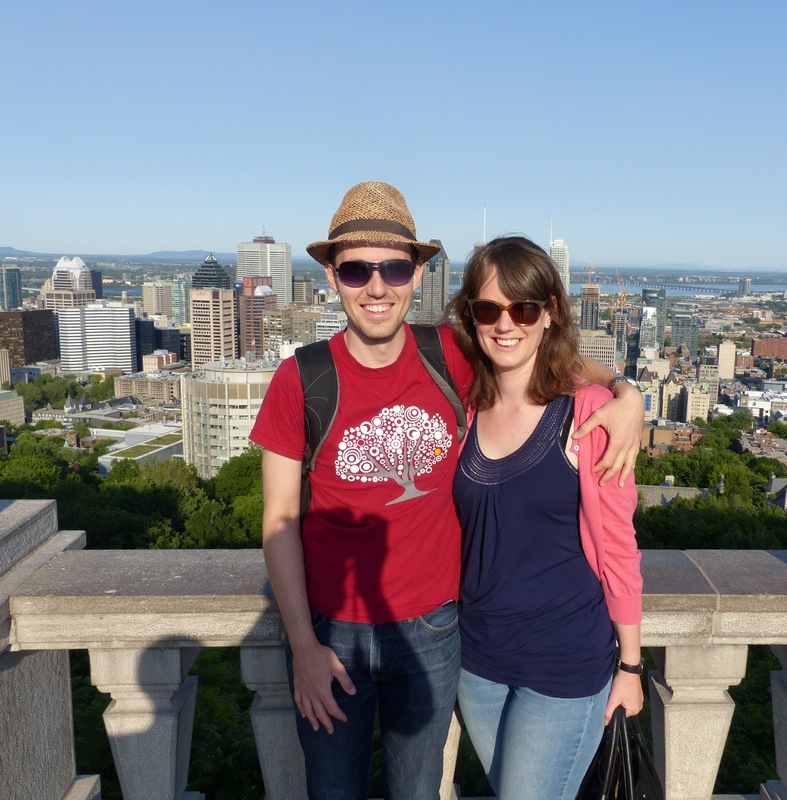 We carried on through and walked up the steep ascent to the peak of Mont Royal. 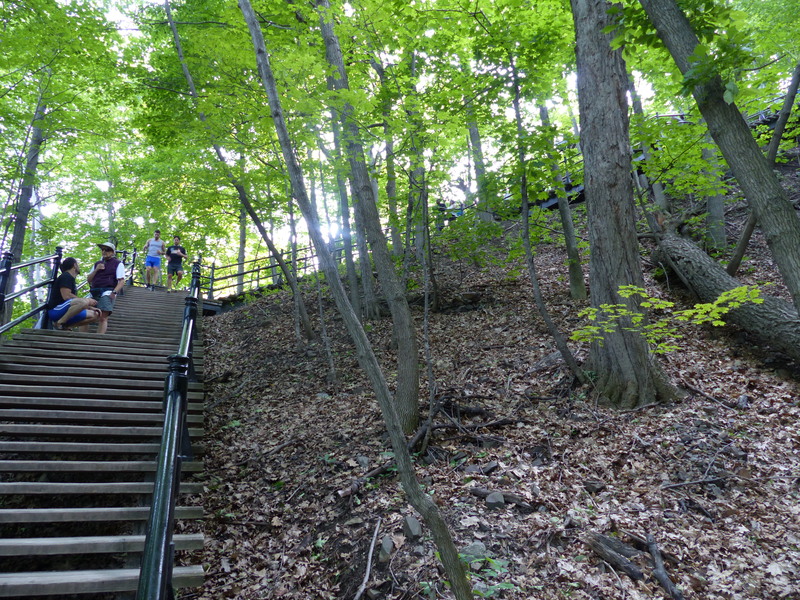 There were a lot of steps on the way up top to the peak of Mont Royal! Standing at just 233m, it’s not really a mountain, more of a large hill which is visible from almost anywhere in the city. 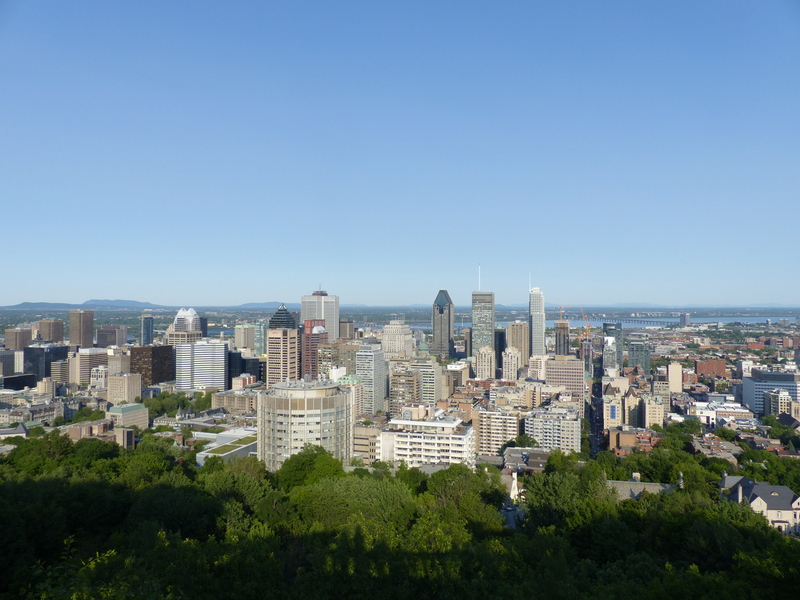 Once at the top it offered excellent views across Montreal. 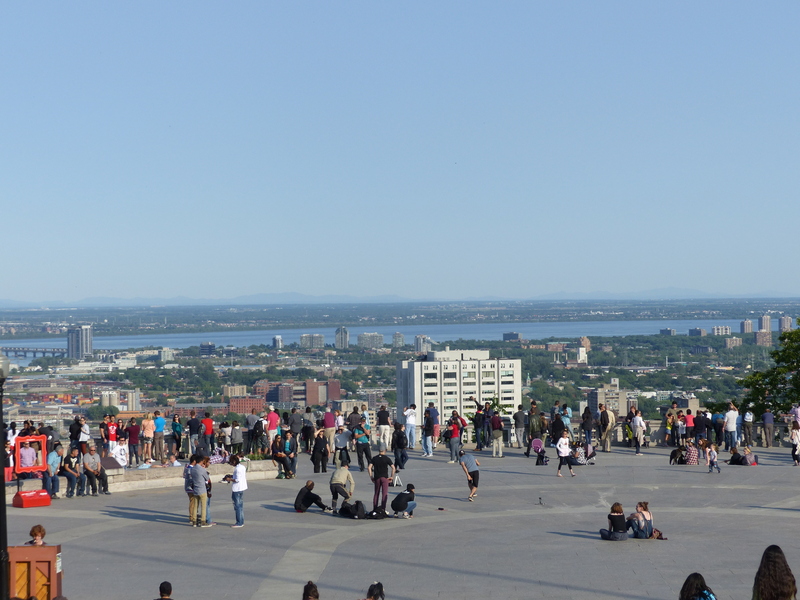 We spent the early evening relaxing on the terrace outside the Mont Royal Chalet which stands near the summit. There was a really good atmosphere on the terrace, with people enjoying the sunshine, playing games, making use of the open air piano, practising their break dancing, or just taking in the excellent views of the city below. Proof that we made it to the top! Inspired by fellow blogger and lover of food Lizzie, who visited Montreal a few months back, we paid a visit to La Banquise. 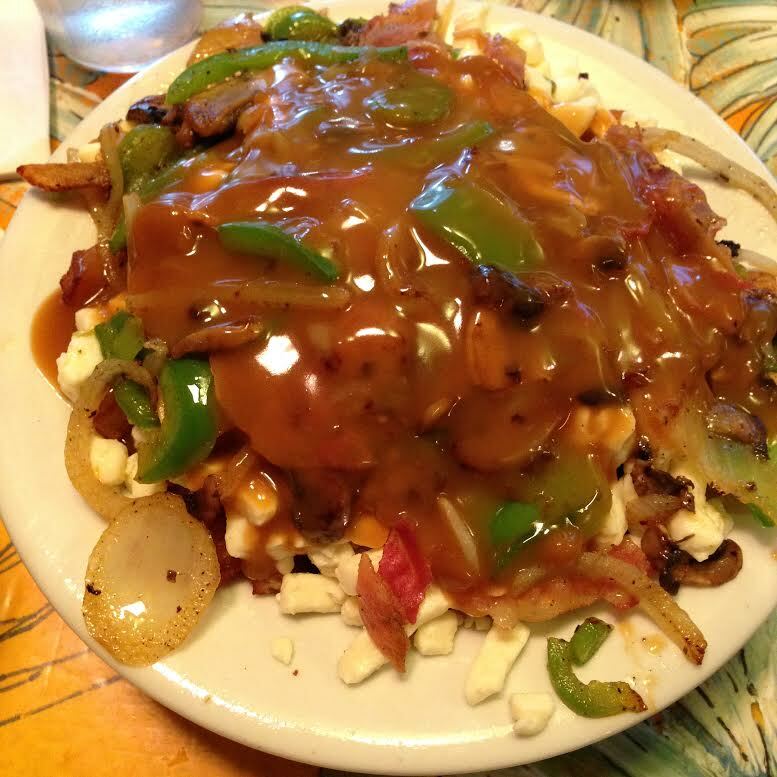 According to Travel & Leisure Magazine this is the best poutine in Montreal, but it appears the internet does not quite agree, with everyone having their own opinion on which is best. There’s even a whole website dedicated to the debate! Since the restaurant was a short 20 minute walk away from where we were staying, we decided to give it a go, as it was clearly as good a place as any to try. The first sign that we were on to a winner was the huge line up outside when we arrived, and so in true British style we joined the queue! 15 minutes or so later and we were sat inside a looking at the menu and feeling a little overwhelmed at the choice of over 30 different types of poutine. I was tempted to go with the traditional poutine in order to get the fairest comparison with poutine that we’d had before, but Stewart convinced me that ‘La Matty’ (bacon, peppers, onion and mushroom) was a far better choice. He was right! Looks disgusting, tastes amazing and essential food when in Quebec. Of course any summer trip wouldn’t be complete without an ice cream and when we had some time to spare before our flight back to Toronto we decided to treat ourselves. Just around the corner from our Airbnb was Cremerie Bo-Bec with a crowd of people outside, again indicating that this was clearly the place to go for ice cream in the area. 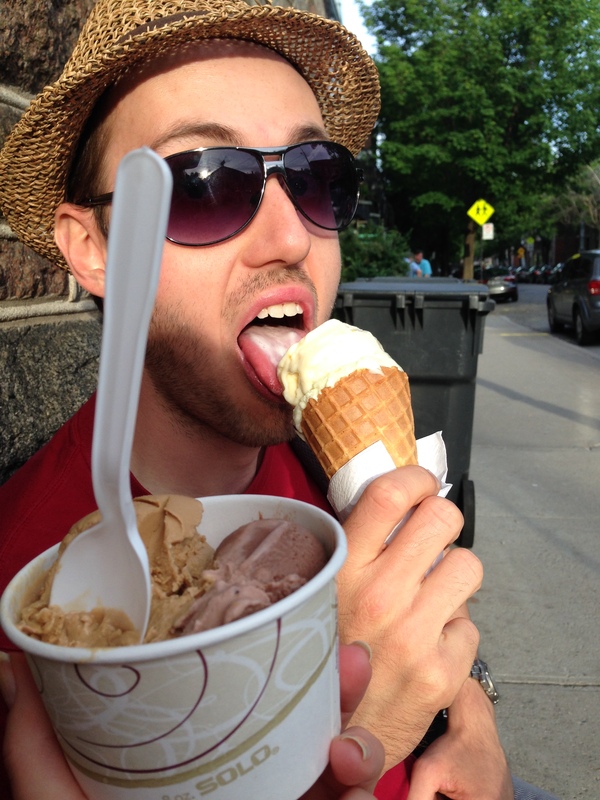 Celebrating an excellent weekend with ice cream! 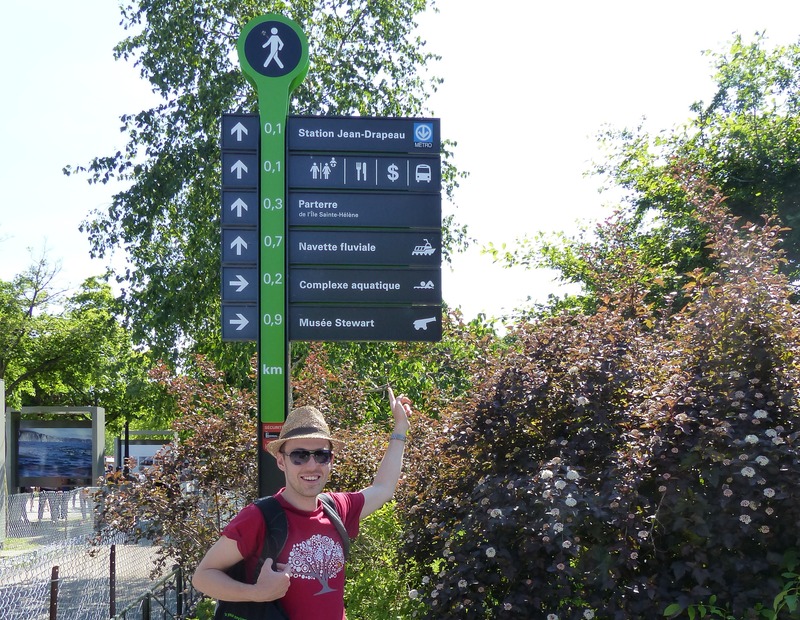 Special shout out as well to the unlimited weekend pass which got us around Montreal on the transit system all weekend for the bargain price of $13. I would definitely recommend one of these if you’re in Montreal for the weekend, especially as it also includes the 747 airport bus and is valid from 6pm Friday to 5am Monday. Unfortunately there wasn’t time to visit the Stewart Museum! It was so good, I’m excited to try to best poutine in Montreal if that wasn’t it! Poutine is so good!! Montreal is definitely on the list of places I want to go ASAP when I move back to the U.S., so I really enjoyed the post. Previous Previous post: Let’s Play Ball! Next Next post: What makes expats grumpy?